I just received the newest release, Beale Street Saturday Night, from Omnivore Recordings and it is raw and pure. 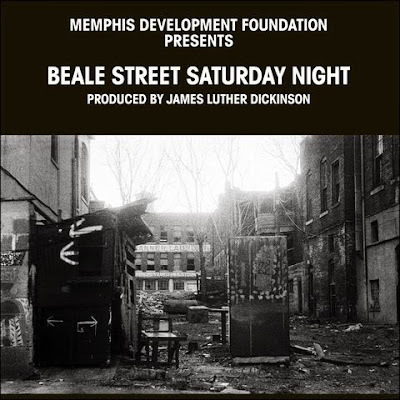 Opening with Walkin' Down Beale Street by Sid Selvidge, the listener hears a blend of soul, jazz, blues and gospel with piano, slide guitar and horns. Fred Ford is up next with Hernando Horn, an exceptional old style blues track featuring exceptionally rich sax work. Grandma Dixie Davis, accompanied by piano is freewheelin and loose. No...this isn't Joe Bonamassa. Sleepy John Estes hits the ground running with Big Fat Mama/Liquor Store. Taking a breather in the track to tell the stories. Prince Gabe has a much more polished vocal presentation and again with story telling dialog. Furry Lewis is easily distinguished on Furry's Blues. A classic with Furry accompanying himself on guitar. Teenie Hodges lays down Rock Me Baby, raw and uncompromised. A more primitive version of the track by Alex with whistling and hammer claps like an old work song is exceptional. Thomas Pinkston tells the story Ben Griffin was killed in the Monarch accompanied by piano. Quite cool. Johnny Woods plays the Frisco Blow, a real authentic train blues on harp. Primitive and excellent! Mud Boy And The Neutrons plays a Dixieland style On The Road Again with every sort of instrument imaginable. Very cool! Thomas Pinkston tells the story of Mr Handy Told Me 50 Years Ago with guitar accompaniment. Unique. Furry Lewis is back with Chicken Ain't Nothin' But A Bird. There is hardly a blues player that is half a story teller like Lewis so this is a particularly cool track. Grandma Dixie Davis wraps the release with Roll On Mississippi. Now I do need to say, I've never heard anyone sing like Grandma Dixie Davis. This is an unusual set of tracks put together by James Luther Dickinson is a cool and historical documentation. Along with the cd you get 5 pages of liner commentary by Stanley Booth, additional descriptives by Jim Lancaster and a number of wonderful photographs.